Develop in the holy land, the kingdom of the wise Solomon, a game created by Philip DuBarry and published by Minion Games. Each round consists out of four phases, to start with the placement phase. You then place your workers in provinces or assign them with a profession like minister, thief, prophet, trader or artisan. You can also place your pawns in a bonus space and these are very powerful. But doing so means that during this phase you are finished, you have to place all your remaining pawns in such a bonus space. In the provinces and on the professions there is only place for one pawn worker. Each player has a fixed number of workers for the whole game. And turn order can also be pivotal as you get no resources when there are no in the general supply. Depleted resources are depleted. Next is the resolution phase. Your workers in the land regions bring you resources, the workers you assigned with a profession can also bring you resources but also a fortune card or victory points. Bonus spaces bring you the starting position, resources or victory points. In this game victory points is the same as money. 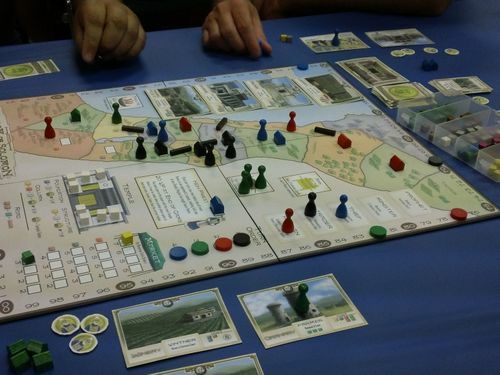 Next is the market phase and trading in Kingdom of Solomon has an interesting mechanism. The order is the way around. The starting player sells one good against a fixed price, the next player can sell a different good also against the starter price, but he can also bring a second good of the same type to the market which than has a lower price. He can also choose to buy the item the first seller brought onto the market. So the price fluctuates but in order to stay on the market you have to buy or sell! So you might even buy the same you just sold against a better or worse price. Last phase per round is the building phase. Then you can build one of the four buildings as displayed on cards. A building cube representing a house is placed in a province indicating that only you can place a worker in this province from now on. The building cards are placed in front of you. In future turns you can also place a worker on one of your building cards and these workers then give you resources, fortune cards or other specials. You can also connect provinces by building roads. A road starts in a province with a building of you and ends in a province without a building space or with another building of you. Connected provinces only need one worker but bring you the resources of all provinces connected. You may also construct on the royal temple. And the player who contributes most to the national temple has access to the high priest. This means that he may place, per round once, a worker in a province, or group of provinces connected by roads, owned by another player thus claiming its resources. The game ends after eleven built buildings in the provinces, completion of the temple or when a single player completes his fifth building. What is interesting in this game is that the stock of raw materials can be exhausted and the number of workers is also fixed, so that is adding something interesting. During playing you will notice that the player who has access to the high priest will place a worker in that interesting connected province where you invested a lot in. To prevent this you might enter the race for the priest or make sure that you will place first, so that you can place a worker first. You will also notice that the possibility to obtain three fortune cards is a tempting one. It is a nice game. The main board looks good and I like the odd shaped provinces with their names. The components may be a bit on the small side and colors could be a bit clearer. The graphics on the cards look really nice. Nice game! Give it a look! Thank you for the review. My copy is still in preorder heaven.